Ch 4, join to make a ring. Rnd 1: Ch 3, (counts as 1st DC), 2 dc inside ring. *Ch 2, 3 dc in ring. Rep from * 4 more times. Ch 2. Join w/ sl st to 3rd ch of beg ch3. (6 groups of 3 dcs. you will be making a hexagon so go round and round...)Rnd 2: Sl st to ch 2 space. Ch 3, 2 dc in same space. Ch 2, 3 dc in same space. *Ch 1, (3 dc, ch 2, 3 dc) in next ch 2 space. Rep from * 4 more times. Ch 1, join w/ sl st to 3rd ch of beg ch 3. ( You now have 6 shells, 6 ch 2 spaces, 6 ch 1 spaces)Rnd 3: Sl st to ch 2 space. Ch 3, 2 dc in same space. Ch 2, 3 dc in same space. *Ch 1, 3 dc in next ch 1 space. Ch 1, (3 dc, ch 2, 3 dc) in next corner. Rep from * 4 more times around. Ch 2, join with sl st to top of beginning ch 3. Change colors for a stripe - Rnd 4: Sl st to ch 2 space. (now form the corner) Ch 3, 2 dc in same space, ch 2, 3 dc in same space. * (Ch 1, 3 dc in next ch 1 space) twice. Ch 1 (3 dc, ch 2, 3 dc) in next corner space. Rep from * 4 more times. Ch 2, join w/ sl st to top of the ch 3. Rnd 5: Repeat pattern established in round 4 with a ch 1 between sets of 3dc except at corners where you ch 2 between sets of 3 dc. 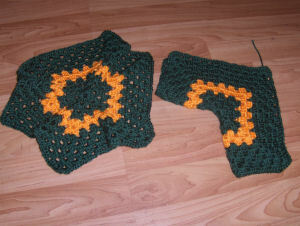 Rnd 6-10 : Switch back to main color and repeat pattern established in round 4. End off. Make a 2nd one so you have 2 halves of the jacket. Fold Hexagon in half to form the 2 sides of the jacket. 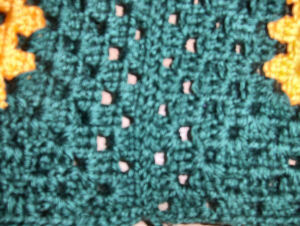 Stitch the 2 halves together at the back seam. 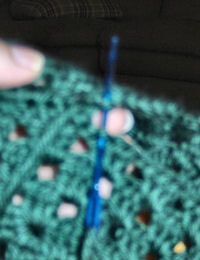 Stitch across the top of the jacket at the shoulder seams in the same manner to the 3rd "3dc" from the front neck edge. Repeat across the shoulder of other side. Rnd 1: Join contrast yarn on cuff 'bottom', Ch 2 (counts as a HDC), HDC in every other stitch around, and in every ch 1 space. Rnd 2: Make HDC front post stitch, then make HDC back post, repeat around cuff. Join in top of ch 2. Ch 2. Rnd 3: Repeat this same round once. You will be making front posts into front posts, and back posts into back posts. Now, *Sc in next stitch, skip 1 st, sc in next, repeat from * around. End off, weave in 3" yarn tail. Bottom edge of JacketJoin yarn in a corner of bottom of sweater, ch 3, - DC around to other side. Ch 2, turn. Alternate Front post DC, back post DC, across. Ch 3 at end of row, turn and repeat across one more row. 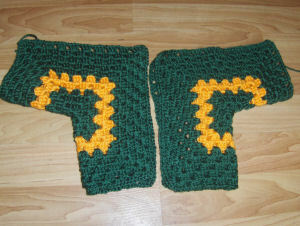 Ch 1 and start sc up the front in each stitch to the top of jacket front. NECK: Ch 3, now 1 DC in each st across to other side of neck. Ch 3 and turn. Front post DC, back post DC alternate across neck, ch 3, turn and repeat previous row. You are now at the right side of the ja cket as it faces you. Sc down front right hand side making four button loops evenly spaced. 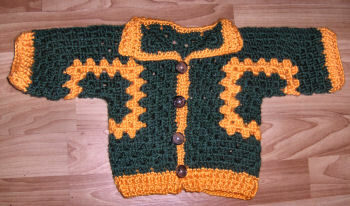 The first button loop will be made approx. 18 scs in where the collar if folded down. To make button loop... sc, ch 4, skip 1 st, sc in next. *Sc in next 8 scs, ch 4, skip 1 st, sc in next. Repeat from * to bottom of jacket. End off. Weave in all ends.